Jacob Robert-Andrew Popiolek, 21, has been identified as being involved in the arson fire that destroyed the historic Thompson Block. A felony warrant for his arrest has been authorized and signed. His current whereabouts are unknown. Apr. 29, 2010 · 12:17 p.m. The Ypsilanti Police Department is looking for information about the location of the arson suspect wanted for the fire that devastated the Thompson Block in September. 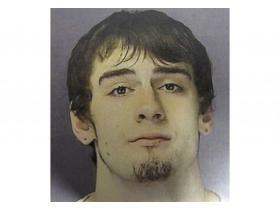 Police said the whereabouts of Jacob Robert-Andrew Popiolek, 21, are unknown and it is possible he has fled the area. They said his last residence was in Ypsilanti and he is known to hang out in both Ann Arbor and Ypsilanti. The incident occurred on Sept. 23, 2009 at 1:38 a.m. At the time, firefighters believed the fire had started on the second floor of the building and spread quickly throughout the structure. It took firefighters from five different departments approximately six hours to completely put out the blaze, with hidden hot spots still a problem until the afternoon. The fire left the main portion of the 149-year-old former Civil War barracks a shell, with little left but rubble and the brick façade. Wooden scaffolding has since supported this portion of the building to prevent collapse. The scaffolding, which protrudes into the adjacent streets, has been an issue of concern for the city since the fire and now has the city in court with the building’s owner, Historic Equities LLC. Stewart Beal, managing member of Historic Equities, said he received a letter in the mail Wednesday notifying him he was the victim of a crime. He said the letter identified Popiolek, who Beal did not recognize, and his charges. He said he had assumed it was arson because of how quickly the fire spread, as well as investigation results from electricians. Ypsilanti Fire Chief Jon Ichesco said a $5,000 reward offered from the Michigan Arson Prevention Committee, for information leading to the suspect’s conviction, could have lead to Popiolek’s identification. However, he said the organization has received numerous tips, accusing dozens of people throughout Ypsilanti in often ridiculous scenarios. Anyone with information is asked to call Detective Jason Cyrbok at YPD, 734-482-9872.